Bridget's Story - Russell Rescue, Inc. Ten years ago Robyn pulled a beautiful little rough coat female out of Austin Animal Control. She was about 5 years old and Robyn named her Bridget. A month later we adopted her to Ginger Jones. Ginger had moved from Houston to Wimberly to get away from the bad weather in Houston. We took Bridget to her home. It was a perfect fit. We heard from Ginger several times after that. She loved Bridget and said she was the perfect fit. Three-four years after that she again got in touch with Robyn. She wanted to give Bridget back. She said she had had some health problems and could not care for Bridget. Robyn told her she would take Bridget back, of course. A few days later Ginger said her “caretaker” would take Bridget. She was relieved that Bridget would be cared for by someone she knew and trusted. Fast forward to April of 2019. Robyn and I got an email from a shelter manager in San Marcos. 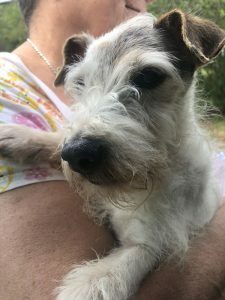 Someone had picked up an elderly female JRT about 12-14 years old. A picture was attached. I saw a dirty, dejected, bedraggled dog standing there with her head down and her eyes squinted. About 4 or 5 hours later our FB admin, Heather, sent us a screen shot of a posting from a woman named Cathleen who was looking for information about a dog in the San Marcos shelter that had a microchip that traced back to an address in Wimberly. She posted her phone number. Robyn called Cathleen. Cathleen told Robyn that she is dedicated to reuniting lost pets and their owners. She works with shelters in the Wimberly/San Marcos area. She wanted to help the senior JRT. After much snooping and checking and digging she had discovered that it was Ginger Jones’ dog. Ginger however had moved back to Houston. Cathleen found Ginger on FB. When Cathleen called Ginger to tell her that Bridget was in the San Marcos Shelter Ginger said, “ Call Robyn Reed.” Ginger was shocked to discover that her “caretaker” had betrayed her. As Ginger had suffered a stroke and was partially paralyzed, she could not care for Bridget. She tried hard to be sure her dog was cared for. She had been sending the woman 50 dollars a month for Bridget’s care! Bridget was never cared for. The poor dog had somehow gotten away from the caretaker and wandered off. That is when she was picked up and taken to the shelter. Robyn picked Bridget up the next day. She was bathed, fed, and snuggled in. The next day she got her to the vet. Bridget was sick. Her teeth are so horribly infected that she is nauseated and weak. Most of her teeth will have to be pulled. Note: Bridget is now a Spotlight terrier. From now on, Bridget will be cared for. Huge thanks to Cathleen and the shelter manager for going the extra mile for a sweet little old dog. It restores my faith in humanity. Russell Rescue, Inc. is funded entirely by donations. These donations are used for temporary housing, spaying/neutering, veterinarian treatments, food, water, etc. Donations are desperately needed to support the terriers in rescue. Please help if you can! Your donations are tax-deductible. Shop at AmazonSmile and Amazon will make a donation to: Russell Rescue, Inc. Support us every time you shop. We are currently in need of Volunteers and Foster Homes in all areas of the country. If you are interested, please contact us and let us know how you can help. 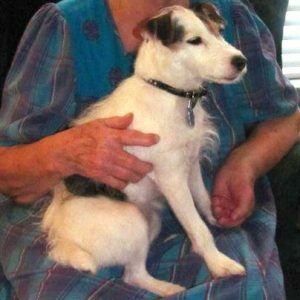 Russell Rescue, Inc. (RRI) is a national network of volunteers dedicated to placing unwanted, displaced or abandoned Jack Russell Terriers into permanent homes. All dogs entering rescue are either temporarily placed in a foster home or must remain with their owners until a suitable home can be found. Our organization is funded entirely by donations. These donations are used for temporary housing, spaying/neutering, veterinarian treatments, food, water, etc.